General Motors has conceded the important small truck market to rival Toyota for many years. 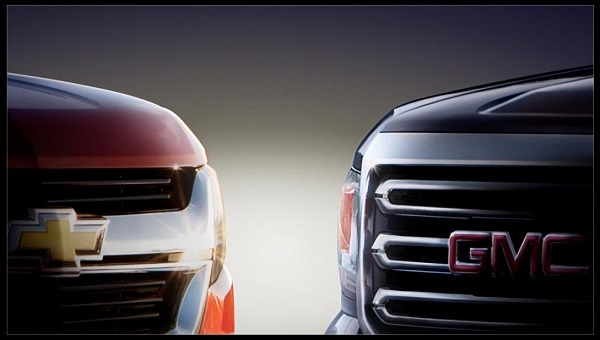 2014 could be the year Chevy and GMC battle back. At a press event today General Motors Executive Vice President and Chief Financial Officer Dan Ammann gave truck fans the first peek at the new 2014 GMC Canyon and 2014 Chevy Colorado. In its press statement about the trucks GM promises they will capable, versatile, and fuel efficient. The company also claims that these two new vehicles will help buyers choose the right truck for their needs. Coincidental to this article we at TN recently needed some facts on small trucks and turned to an expert. We asked him why the small trucks from Ford, GM, and Dodge seem to have gone away. He answered that the small trucks grew almost as large as the full size pickups and the full size ones were more efficient, so they were basically abandoned. However, GMC and Chevy are losing out on huge numbers of small trucks sold and want to correct that for the 2014 model year. The sales numbers and facts back up this view that a few years back GM, Dodge, and Ford decided they would give up on small trucks. After all, why sell a customer a small truck at a small profit when one can sell as customer a large truck at a larger profit? Makes sense if you think about it that way. It would be a sound business plan except that Toyota makes a small truck called the Tacoma. This year Toyota is on track to sell about 160,000 Tacomas. That is 160,000 trucks that Ford had no product with which to compete. Dodge became Ram and when it did forgot about the Dakota. Chevy still builds the smaller truck called Colorado and GMC still makes the Canyon. However, their sales are way down year over year and this year combined they are on track to sell less than 8,000 units. But GM hasn’t given up. GM can’t simply concede the small truck market to Toyota, who makes all their trucks in the US by the way. The Toyota Tacoma outsells the Camaro, Corvette, and Volt – combined. In fact the Tacoma is about as large in terms of units sold, as all of Cadillac. So the market cannot be ignored by a company fully capable of producing a great small truck.